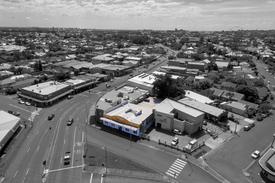 4 Commercial Real Estate & Properties in Broadmeadow are listed in 3 categories. We have 2 OfficesSale & Lease , 1 Medical and Consulting PropertiesSale & Lease and 1 Retail ShopsSale & Lease . Located in prime, sought after medical precinct with excellent medical precinct with excellent medical related tenants nearby. Parking for three vehicles on site. Quality extensive fit out. Vacant now. Very affordable rent. Contact Patrick Mitchell on 0421 000 033 DISCLAIMER We have obtained all information provided here from sources we believe to be reliable; however, we cannot guarantee its accuracy. Prospective purchasers are advised to carry out their own investigations and satisfy themselves of all aspects of such information including without limitation, any income, rentals, dimensions, areas, zoning and permits. 133m2 approx of highly exposed commercial office area Private entry, reception, 4 separate offices all smart enabled Amenities, fully serviced kitchen area and 1 onsite car park Located close to Public Transport rail and bus links $27,572 gross per annum plus GST Many Uses: Consulting Rooms, Medical, Planning, Engineering.